The installation presents the viewer with five “stations” located in front of each of the five video monitors. Four stations are centered on small (2.7 in. diagonal screen) LCD monitors. Mounted above each LCD monitor is a single videodisc player. At each LCD station a loudspeaker is mounted on either side of the small monitor. The LCD monitor, with associated videodisc player and each loudspeaker, is mounted on custom-designed armatures made from steel pipes that attach to the ceiling. The fifth station is in front of the large (25 in. diagonal screen) CRT monitor. This monitor is wall-mounted. Resting on top of the CRT is the sequential switcher. Figure 2 shows an LCD video station with two loudspeakers and a videodisc player. The CRT station is also visible on the left. Each LCD monitor presents one of four video segments described in section 2.1. The video segments have a duration ranging from two to six minutes, and upon conclusion each segment is repeated continuously. The source of video for each of the LCD monitors is its associated videodisc player. The larger CRT monitor shows video clips output by a sequential switcher. Positioned at the CRT station, the sequential switcher automates the taking of clips from each videodisc player. The clips have a duration of 7 to 12 seconds. The sampled clips are fed to the CRT in sequence, from LCD stations one through four. At the completion of the sequence, it is repeated continuously. The four LCD stations have their own audio tracks synchronized to the video. The source for the four audio signals is the individual videodisc players. Left and right audio output channels on each videodisc player are connected to the left and right loudspeakers at each station. The CRT station does not have audio playback. Figure 3 shows the signal path for one of the four audio-video channels. Audio-video signals originate from each of the four videodisc players. Left and right audio jacks on the videodisc player connect to input jacks on the left and right loudspeakers at each of the four stations. The audio cabling connects by using standard RCA plugs. The video output on each videodisc player connects to an RCAY splitter. The split signal is routed to both the sequential switcher and one of the four LCD monitors. The video connections from the RCAY splitter to the sequential switcher require RCA-to-BNC adapters. Video connections made from the videodisc player to the LCD monitors require RCA-to-minijack (also known as ministereo) adapters. Video connection between the sequential switcher and CRT monitor is made using coaxial cable and BNC connectors. In general, Birnbaum prefers that the audio and video cables run inside the hollow metal armatures used to mount the speakers and the LCD monitors. However, as a practical matter, it is not possible to snake all wires and plugs through the armatures. External wires are then neatly bound to the armature. In past installations, electrical tape and nylon wire ties have been used to bind the wiring to the armature. While Birnbaum makes no attempt to conceal the workings of the installation, the appearance should be “clean” (Nielson 1993), with wires, cables, and plugs as unobtrusive as possible. In all, eighteen components require alternating current (AC) power: eight speakers; four videodisc players; four transformers (AC to DC) for the LCD monitors; one CRT monitor; and the sequential switcher. All components use U. S. standard 120V, 60 Hz. Past installations have used a single power cord running along the exterior of each LCD armature. This cord terminates at a small outlet box, which sits behind each videodisc player. The power cords for the LCD transformers and videodisc players plug into the outlet box. The installation is comprised of five “stations” centered on the four LCD monitors and the single CRT monitor. The physical relationship between the stations is not fixed. Positioning the stations has always been the prerogative of the artist based on her interpretation of the particular exhibition space. According to Birnbaum, the key element in the positioning of components is to encourage the viewer to move through the exhibition space (Birnbaum 2000b). Although “passage” through the installation is important, the viewer should not perceive a specific “destination. 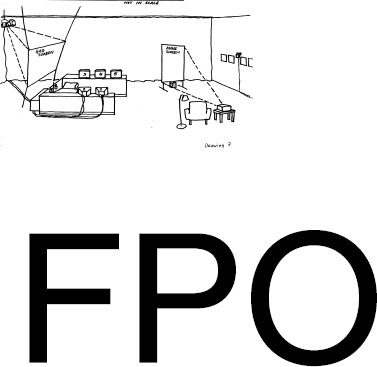 ” Therefore each station receives equal compositional weight, and no single station is emphasized by more prominent positioning in the exhibition space. Birnbaum uses the architectural features of the exhibition space to promote movement through the piece. For the recent exhibit, Seeing Time at the San Francisco Museum of Modern Art, the piece was placed at the entrance of the exhibition, in close proximity to stairways and elevators that drove viewers through the installation. 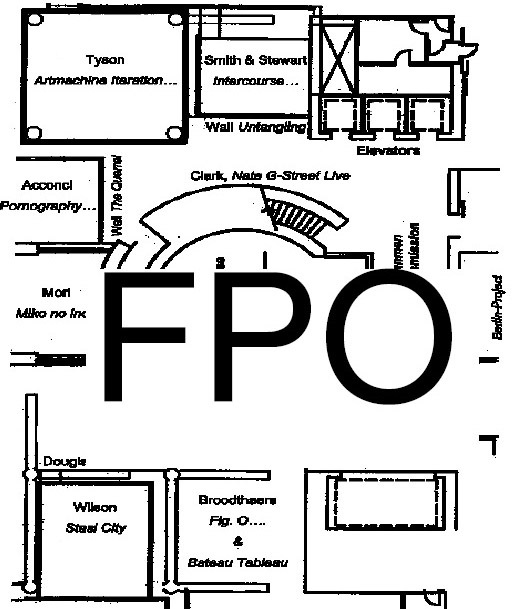 A detailed floor plan of the SFMOMA exhibit is presented in figure 4. 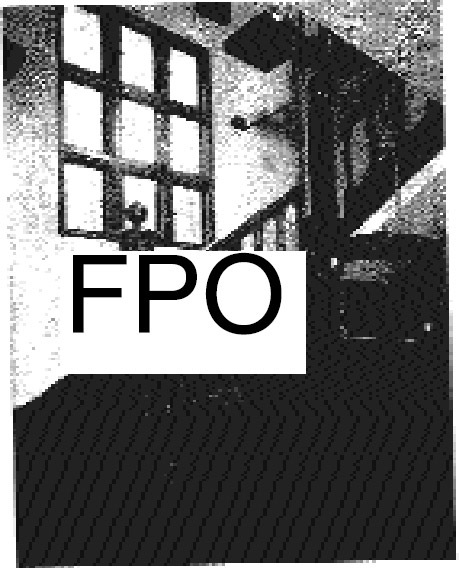 Passage is also emphasized in the installation in the Kramlich residence, where it is centered on the main stairway, as illustrated in figure 5. While there are no prescribed, measured relationships between the main components in the installation, there are fairly rigid aesthetic criteria that govern the composition (Vitale and Birnbaum 2000). Birnbaum wants the viewer to see, or at least be immediately aware of, the larger CRT monitor at all vantage points within the installation. The large monitor should emerge from the background upon the viewer's first engagement with the piece. Likewise, all vantage points should allow for most of the other compositional elements to be revealed. With some distance, the smaller monitors should appear as lights, with the video image indistinguishable. 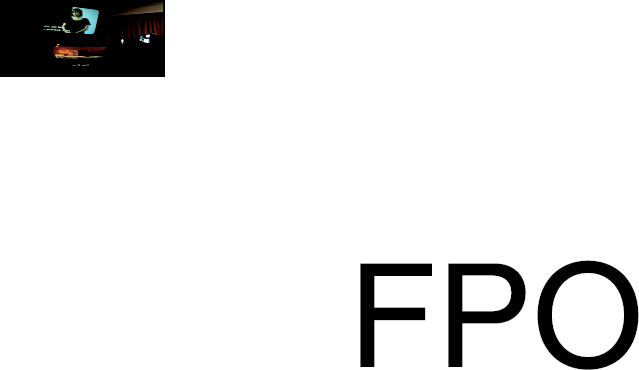 As much as possible, these “lights” should be peripherally apparent when the viewer is positioned in front of a single LCD monitor. The four LCD stations are intended to actively engage the viewer. These monitors have a typical viewing distance of only 20 in. and the displays are hard to see at an angle. While these monitors place certain demands on the viewer, once engaged, he or she is presented with coherent narrative content. On the other hand, the CRT promises the viewer a more familiar experience derived from television. Its longer viewing distance and more conventional presentation invite a more passive form of engagement. However, unlike the LCDs, the CRT displays quick snatches of video with no discernible narrative content. The overall effect is increasingly disjointed since the CRT station has no dedicated audio track, making the jumbled cross talk among the four LCD stations very apparent. Prior to display, Birnbaum has always worked out the relationships between the main compositional elements. 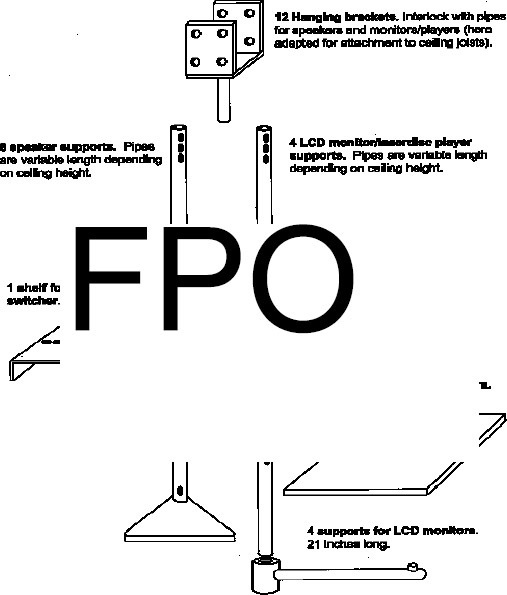 In past installations the speaker height has varied, just above or below the plane of the videodisc player. The horizontal armature and the mounts used for the LCDs allow a large degree of adjustment in the X, Y, and Z directions. This flexibility is often used for effect, avoiding a strictly linear or symmetrical presentation. In addition, the length of the armatures is entirely dependent upon the ceiling height, introducing another variable that is subject to change from one exhibition space to another. Despite Birnbaum's subjective interpretation of her work within a given exhibition space, many compositional elements are fixed. For example, the steel armatures used to mount the LCD monitors, videodisc players, and speakers are more precisely determined. Figure 6 shows the basic design of the armatures, giving fixed dimensions where applicable. These armatures are usually made using 1 to 2 in. diameter steel pipe. In previous installations, the pipe has been painted matte black, gray, or gunmetal. In all cases, the armatures attach to the ceiling of the exhibition space and present the LCD monitors at eye level. The monitors are mounted to a horizontal section of the armature, projecting outward at a right angle to the vertical section. The horizontal extension of the armature is 21 in. The manufacturer-recommended mount for the LCD is fixed to the end of the horizontal section of armature. The vertical section of each LCD armature has a 161/2 in. x 17 in. platform to support the videodisc player. This platform is positioned approximately 8 in. to 14 in. above the LCD monitors. The large CRT monitor is typically wall-mounted, using the mounting system recommended by the monitor manufacturer. The installation is lit diffusely, typically without accents on any of the compositional elements. The light levels should be set similar to that for a “painting in a museum” (Birnbaum 2000a). In general, video and film are displayed at lower levels of illumination, though contemporary video equipment has the capability to carry at much higher light levels. Birnbaum feels the traditional, more dimly lit “black box” exhibition space for video and film encourages a certain passivity in the viewer, discouraging movement through the piece (Birnbaum 2000a). Optimum sound levels have never been quantified and are very dependent on Birnbaum's interpretation of the exhibition space. The challenge is to ensure that each of the four sound tracks is clearly audible when the viewer engages its LCD monitor, while at the same time ensuring that no one sound track dominates when the viewer considers the piece as a whole. Optimally the four channels are balanced with one another, allowing some sound seepage from one LCD station to the other. However, when the viewer approaches a particular station, sound from the other stations should become increasingly peripheral. When the viewer moves in front of an LCD monitor, the sound from that station should be very clear, with only hints of the other stations. At this point, the sound level should be approximately that of a “clear conversation” (Birnbaum 2000a). Birnbaum has a general preference for the sequence in which the viewer is presented the four LCD stations (Birnbaum 2000a). The first station should be the singer performing “Wound of History” (see fig. 1). For Birnbaum, the song sets up the “emotive baseline” for the entire installation. The footage of the demonstrations in progress follows the song. The next LCD station shows government authorities shutting down the CNN and CBS news broadcasts. The last station shows a continuance of communication by different means, particularly the fax machine. In cases where the piece can be approached from many directions (as in the Seeing Time exhibition, see fig. 4), the sequence is established based on a judgment of how the typical viewer would most likely approach the installation.